Vacation rental apartment. 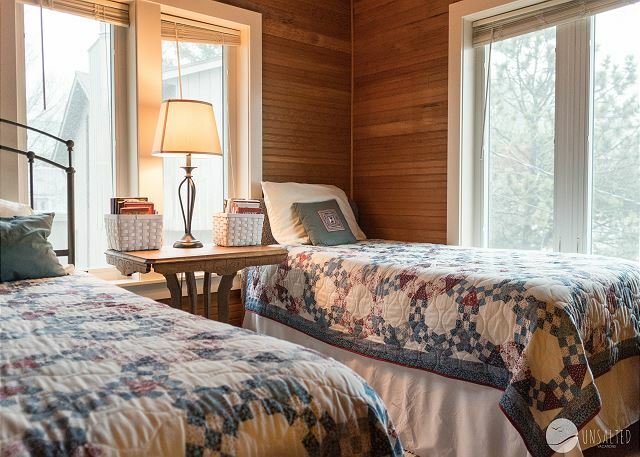 Sleeps 12, 5 bedrooms, 2 bathrooms. No pets allowed. 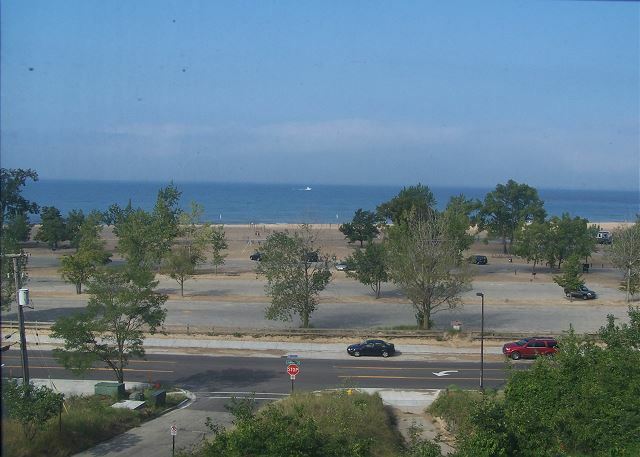 Yes, that's Lake Michigan! So Beautiful.. The living room and dining area are open to each other. 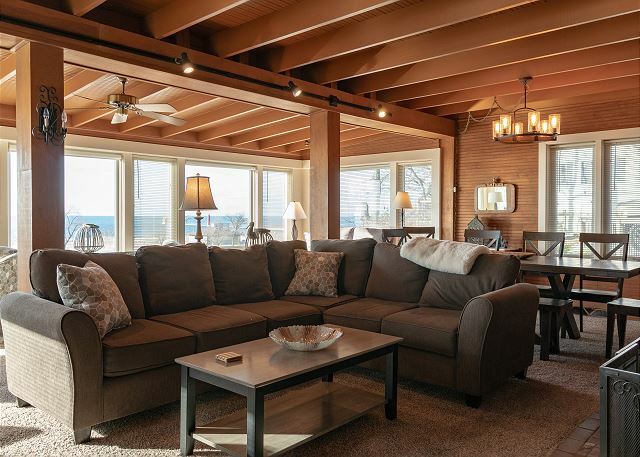 Plenty of comfy seating for everyone to enjoy the spectacular Lake Michigan Views. The porch on the main floor connects the living room to the outside patio. It has a twin daybed with trundle. Main floor bathroom with a step in shower. Bedroom #3 upstairs has a queen and twin bed and Lake Michigan views. Bedroom #4 upstairs with two twin beds. Bedroom #5 with a full bed. The second floor full bath has a tub with shower. Deck overlooking Grand Haven State Park. You will be able to see Grand Haven pier and lighthouse. Exterior of Happe House. Bottom floor is Apartment B and the top two floors are Apartment A. 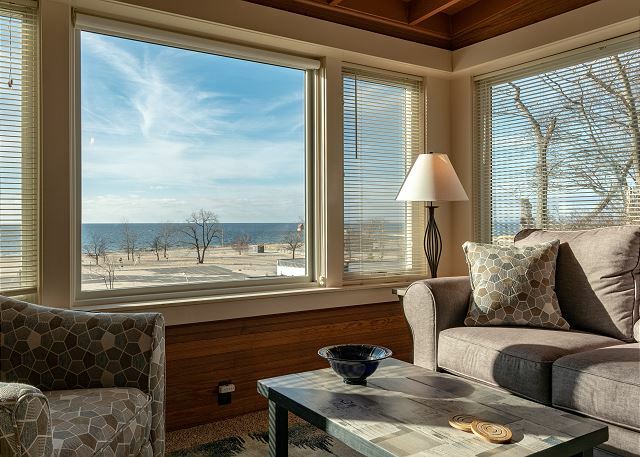 No better viewing spot of Lake Michigan and the Lighthouse than from the deck of this home across from the Grand Haven State Park Beach! The beach is only 250 ft away. 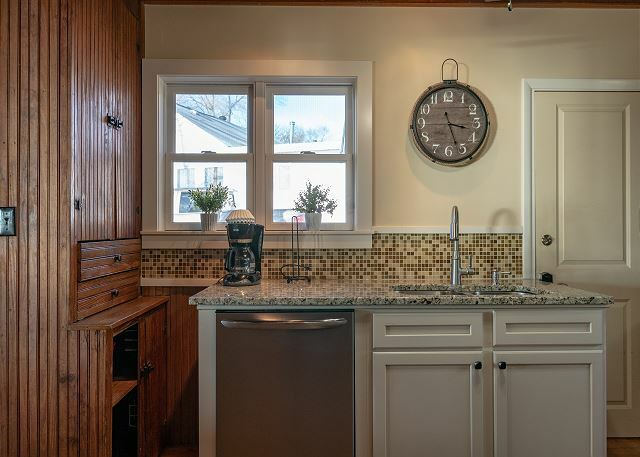 The perfect place for friends and family to gather, relax, and make memories. The house features 5 bedrooms, 2 full bathrooms, a fully equipped kitchen, and a spacious living room and dining area. 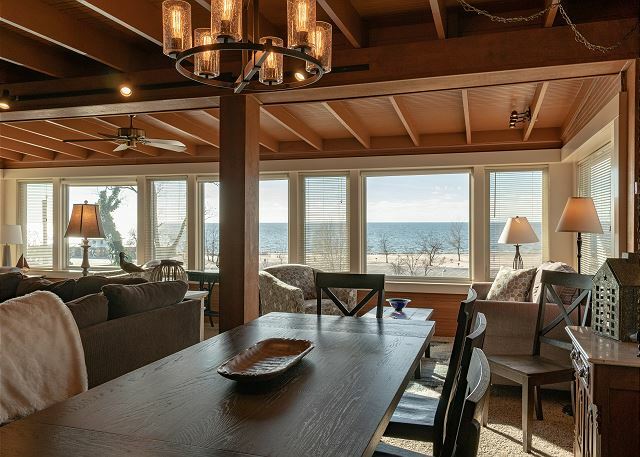 Enjoy the expansive view of Lake Michigan through the large windows. 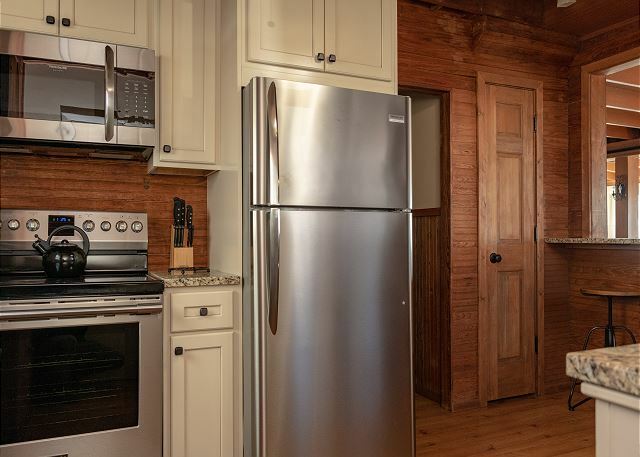 The kitchen has pots and pans, dishes, cooking utensils, and all standard appliances. 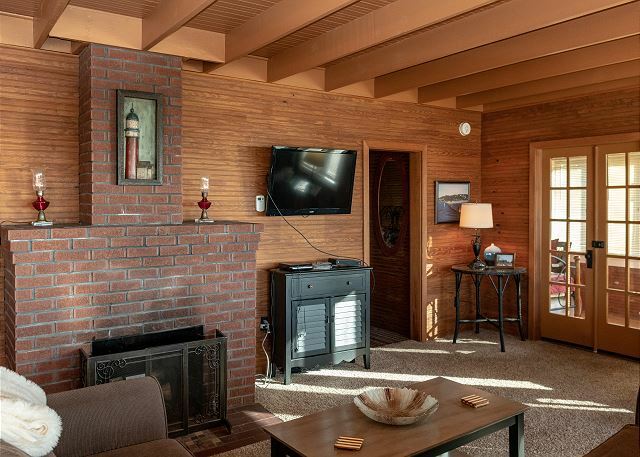 There is a TV in the living room with cable, and internet is provided as well. In addition, there is a stackable washer or dryer in-unit. Have more than 12 people in your party but still want to enjoy being only steps away from the famous sandy beach? We have a solution! This three story home features an apartment that rents separately from the house ("Happe House Apt B" - VRBO #4376622). 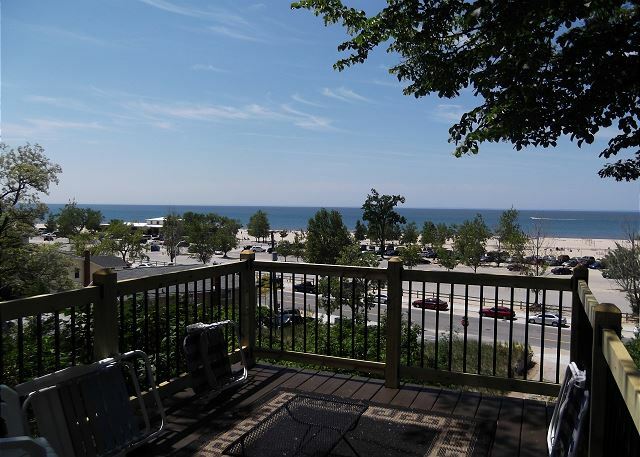 The lower level apartment features two bedrooms, one bath, kitchen, large living and dining space with double sliders that open to a large deck overlooking Lake Michigan. If available, the home and apartment can be rented together for additional living space for larger groups. 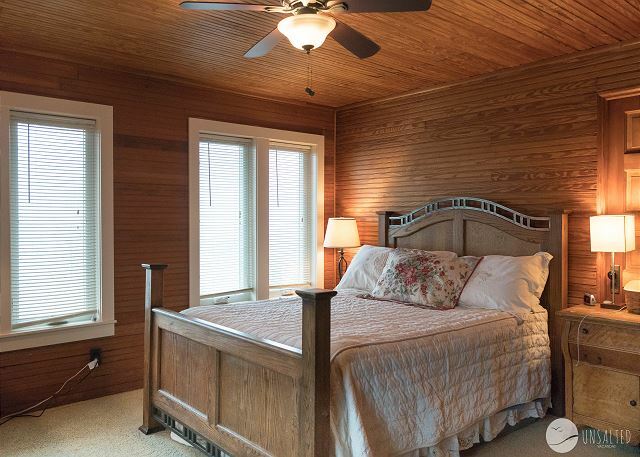 This unit sleeps 12. All bed and bath linens are provided. 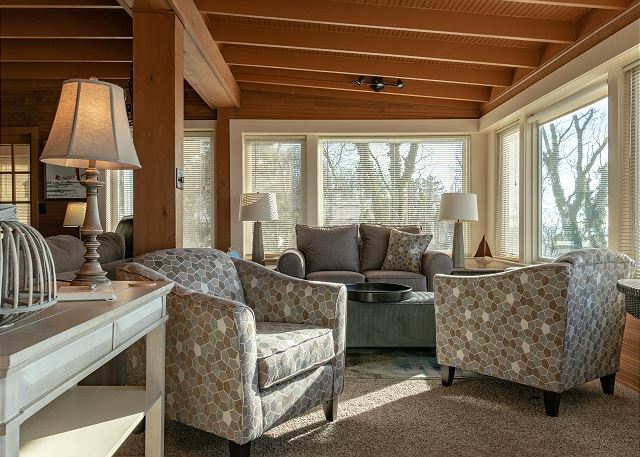 The private deck off of the porch is a great spot to relax and take in the gorgeous Lake Michigan sunsets. There is patio furniture and a gas grill available for your use. Parking is provided for three vehicles right up by the house. Happe House perched in the dune across from the Grand Haven State Park and Beach. It's the first house on the hill, so nothing is blocking your view. Walk across the street and you're at the beach, or head down the boardwalk along the channel to check out the downtown area. Downtown Grand Haven is only 1 mile away and features lots of great restaurants, boutiques, coffee shops, toy stores, and more. If you're looking for a family-friendly location, this is it. 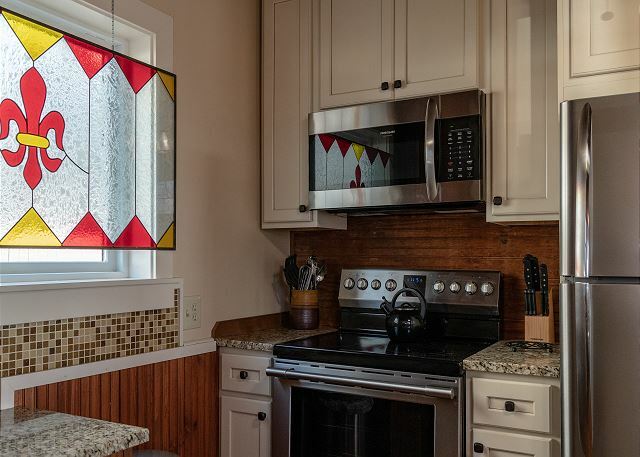 All of these opportunities are available around the area: charter fishing, trolley rides, splash pad, playgrounds, nightly musical fountain, worship on the waterfront, art fairs, parades, festivals, the list could go on and on. Very happe (happy) at this location. 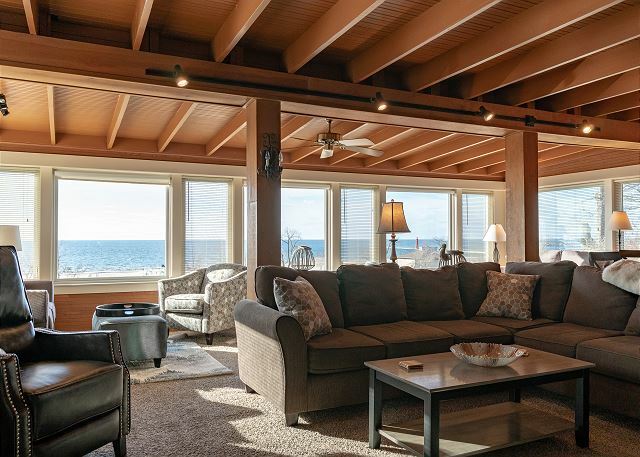 The house was a perfect location to enjoy the beach. The views from the huge great room was magnificent. We enjoyed family dinners and family games that made wonderful memories. We did have 3 nights that the air conditioner would not keep up. The temperature was 84 in the upstairs bedrooms making for an uncomfortable experience. Hi Carol - thank you for the feedback on the air condition, we will take a close look at that. Despite that, we are very happy that you enjoyed your stay and we hope you'll come see us again soon. Great for family fun activities and rest and relaxation. It's Absolutely Wonderful! Hi Shawn, it was such a pleasure having you vacation with us. Thanks for the great review and we can't wait to have you back soon! This is our 4th year renting the Happe House. 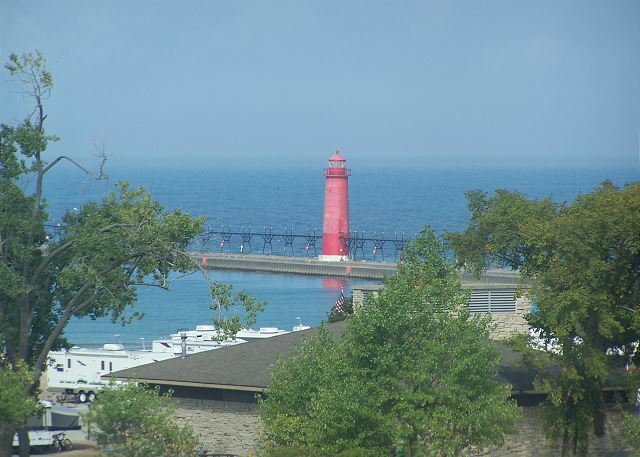 The view of the of Grand Haven State Park and Grand Haven pier is priceless. Amazing sunsets! We always have a great time with our family and enjoy the spacious accommodations. The house is well maintained and clean. The management company was very responsive to our needs. There are numerous restaurants and brew pubs with walking distance. I would highly recommend this lovely getaway. Thanks so much for an awesome review, Roger! We are glad that you've been able to enjoy vacation at the Happe House time and time again. Hope to see you for your 5th visit soon!